Depending on your home city, you may either complete Dasher Orientation online or in person. Click "Info On Your City" above, and then select your city's page for details about the process, location, and times. 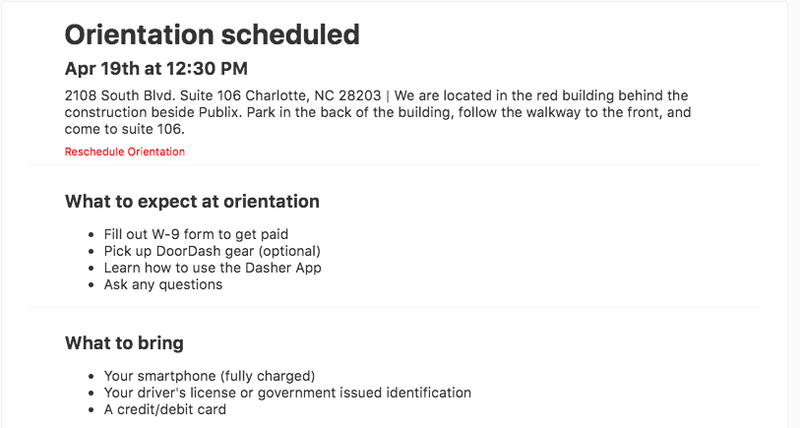 For cities with in person Orientation, you'll receive a prompt to schedule your Orientation time once you complete your application at https://www.doordash.com/dasher/signup/. Questions about your application? Visit www.doordash.com/help to contact our Support team. Need to reschedule your Orientation? Click "Already started signing up?" Enter the email and the phone number you used to apply. Click the small "Reschedule Orientation" link (like in the picture to the right) to choose new, convenient Orientation day and time. Last step! Attend your new Orientation time, get activated, and begin earning money on the DoorDash platform!